So one day I was walking home from work. The road I live on, as some of you know, cuts through forest, with no shoulders and trees right to the edge. When I was about three hundred feet or so from our driveway, I saw our Boxer, Luke (officially named Skywalker von Stowe), standing in the middle of the road. He’d never done that before, and supposedly knew better. I wasn’t too happy. In fact I yelled at him. No response. He just stared at me. Well, he had bad eyesight. He’d been born with a heart condition and his medication gave him blurry vision. I continued yelling, afraid a car would come flying down the road. I added stomping toward him to the shouting. He continued to stare. Luke never was very intelligent. But after a moment, he turned so that instead of facing me, he was perpendicular. And instead of that short stubby Boxer tail, I saw this long, graceful tail. A long, graceful, cougar tail. All I had seen was that faun coloring, the body shape and size. I assumed it was Luke. If I remember, at this point, I froze. I mean, think about it. What do cats like to play with? Moving toys. And here I was stomping toward a cougar, waving my arms and yelling. I may have thought a swear word or two. The cougar continued to stand and stare for what seemed much longer than it actually was. And then it casually strolled off into the woods. No panic on its part that a human was approaching. I ran the rest of the way home and told my husband what I’d just done. We figured the cougar had come to investigate our chickens. I told him how I’d thought it was Luke, how I thought he didn’t recognize me. Luke, by the way, was curled up on his favorite chair, snoozing the day away. In memory of Luke, who never went out on the road when he wasn’t supposed to, who lived a good long life of many years, and was a very sweet boy. In the picture below he was a bit worried as all our dogs were terrified of that scary Fat Cat lying behind him. ← What If…There Was a Postscript? I love those last two paragraphs. It was definitely one of those ‘oh sh**” moments! LOVE this one Lisa! a big loving memory hug for Luke! Goosebumps at what could have happened. Luke’s paw looks like he’s warding off the cat. All of my dogs, including a huge Irish Wolfhound, were terrified of that cat. She had them trained. 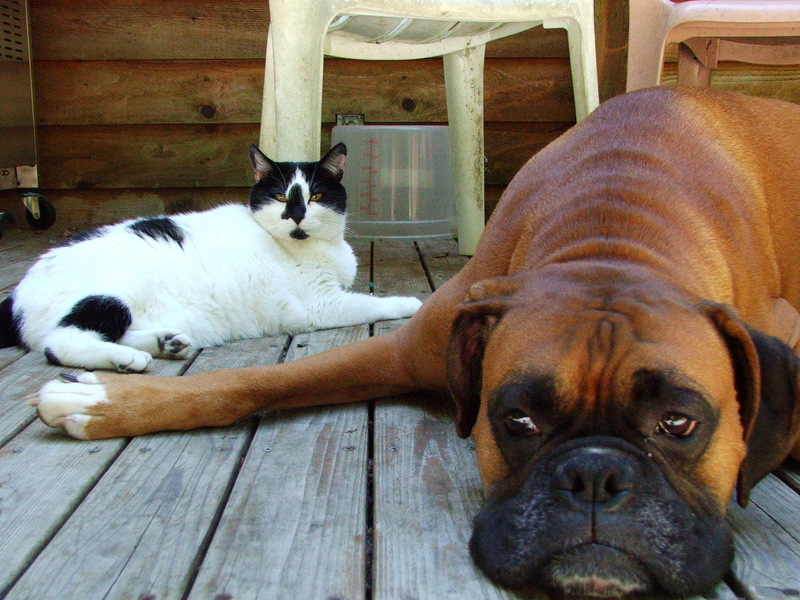 I remember once poor Luke the Boxer was standing in the hall whimpering because the cat was simply sitting in the middle of the floor. He was too intimidated to walk past her, poor thing. I believe the cat loved the power.